South Mountain, part of the Blue Ridge Mountains, serves as a prominent geological feature in the area. 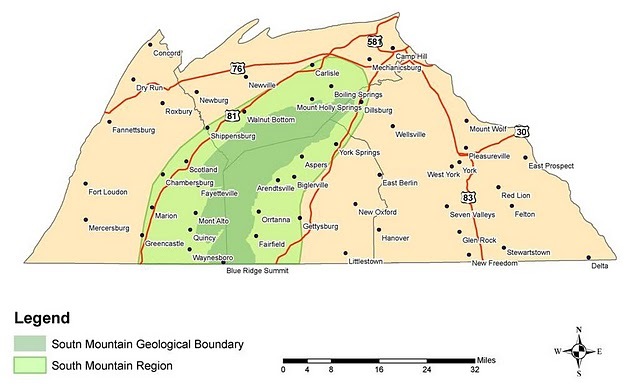 The mountain formed from continental collision and is comprised of sandstone, while the surrounding valleys are comprised of limestone (most notable is the Elbrook formation of bedrock). Specifically in the area of the Dickinson College Farm, colluvium from South Mountain has eroded from the mountain, covering the limestone bedrock and giving the area more sandy soils. This is an interesting feature because the soils over the limestone bedrock originate from South Mountain sandstone, rather than residual limestone. Because the sandstone bedrock of the mountain is more resistant to erosion than the limestone in the valleys, much of the water from precipitation that runs off the mountain erodes streams in the limestone at the base of the mountain (such as the Yellow Breeches creek). Another prominent geological feature in this area is the diabase dike outcrop which is comprised of igneous basalt parent rock. Typically, the water table is about 45 feet below the soil in this area, however the diabase acts as a hydrologic barrier. When precipitation flows down South Mountain, a large amount of water is produced and most of it is able to erode the limestone and continue flowing. However, some of the water is trapped by the v-shaped diabase, creating a confined aquifer. Since Boiling Springs is located at the interior of the V of the diabase, the water table is altered and water is pushed out of the springs giving the impression of “boiling” springs. The Yellow Breeches creek drains 219 square miles of land in Cumberland County, ranging from forested to agricultural and suburban land. The creek starts on South Mountain and flows 49 miles until it joins the Susquehanna River. The watershed around the headwaters is primarily Michaux State Forest, while farm land dominates the middle of the watershed, and the end of the creek watershed is primarily in urban land. The watershed land around the Yellow Breeches was first open to settlement in the 1730s, with much of the surrounding land used for agriculture and multiple mills places along the Yellow Breeches. 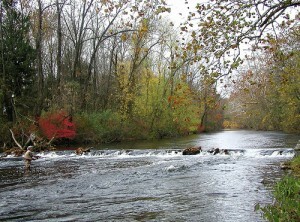 Today, the creek is widely used for recreation including fishing, swimming, and canoeing. South Mountain in south central Pennsylvania, part of the Blue Ridge mountain sequence that stretches to Georgia, is comprised of sandstone and quartzite and is among the oldest mountains in the region. Michaux State Forest encompasses 85,000 acres of forest on South Mountain featuring oak, maple, birch, and pine trees along with native wildlife. The sandstone of South Mountain eroded over time and contributed to the alluvial soils covering the limestone bedrock of nearby valleys. South Mountain is a prominent geographic feature in the region, often used as a point of reference because of its visibility. The Appalachian Trail is a privately managed trail in the national park system that stretches 2,181 miles from Maine to Georgia. The trail was completed in 1968 after an idea proposed by Benton MacKaye in 1921. Today, the trail is maintained by 31 trail clubs and multiple other groups, including the Appalachian Trail Conservancy. The Appalachian Trail also runs across the northern Blue Ridge mountains in southern Pennsylvania. Locally, Boiling Springs marks the mid-point of the Appalachian Trail and there is an ATC field office in Boiling Springs. The Appalachian Trail Conservancy (ATC) is a private, nonprofit organization dedicated to the maintenance and preservation of the Appalachian Trail through volunteer work. The mission of the ATC is to manage the trail so that it’s ecological, historical, and cultural value with remain intact for generations to come. The ATC encourages the human connection to nature with community-based education and motivation around the Appalachian Trail. Duffield silt loam comprises about 60% of the farm soil and is comprised of residual limestone combined with other weathered parent rock. The soil layer is about 50-70 inches thick, and the soils are well-drained with moderate runoff. The soil texture is a fine silty clay, often yellowish brown or pale brown in color. Huntington silt loam comprises about 30% of the farm soil and is comprised of sandstone and limestone alluvium. The soil layer is about 40-70 inches thick, and the soils are well-drained with moderate permeability. The soil texture is a gravelly silt loam, typically dark grayish brown in color. Monongahela silt loam comprises a small portion of the farm soil and is comprised of old sandstone alluvium. The soil layer is about 40-71 inches thick, and the soils are moderately drained with moderate permeability and varied runoff. The soil texture is a fine granular silt that is dark grayish brown in color. Murrill Channery loam comprises a small portion of the farm soil and is comprised of sandstone colluvium and aged limestone residuum. The soil is greater than 60 inches thick, and the soils are well-drained. The soil texture is a fine loam that is dark brown to reddish brown in color. Neshaminy gravelly silt loam comprises a small portion of the farm soil, primarily over the diabase, and is comprised of weathered diabase material. The soil is 35-60 inches thick, and the soils are well-drained with moderate runoff. The soil texture is a fine loam that is dark brown to yellowish red. South Middleton is located in south central Cumberland County in Pennsylvania. The township was established in 1810 and currently occupies 51.6 square miles with 13,000 residents. South Middleton is home to multiple recreation opportunities including trails (such as the Appalachian Trail), lakes, parks, and streams.